What is an Ellen? Every afternoon my mommy sits in front of the TV and ignores me for an hour. She ignores everyone except the TV and her friends that she tweets with to watch something called Ellen and tweet about Ellen. Every week or so, she picks me up and puts me in her lap to watch kittens open doors or climb in boxes or sit in drawers or do something else that cats do every single day as though it's special and I should be impressed. I don't get it. Am I missing something? Since your mommy named you Ellen kitty, you do seem to miss the obvious. Ellen is not a thing, she's a person. Well, she's more than a person. She's a cat person. I don't mean someone who likes cats. Ellen really is a cat who passes as a person. Cats who watch Ellen know this because she leaps across her table and stretches in her chair and plays tricks on people. She also has lots of cats at home to keep her company. Not all parents watch Ellen. Some watch Oprah and others watch The View. But cats watch Ellen because Ellen is a cat person. She plays with guests the way we play with our rubber mice. Why? Because she's a cat person. As a tribute to the world's best cat person, we are naming Ellen our Cat Person of the month. 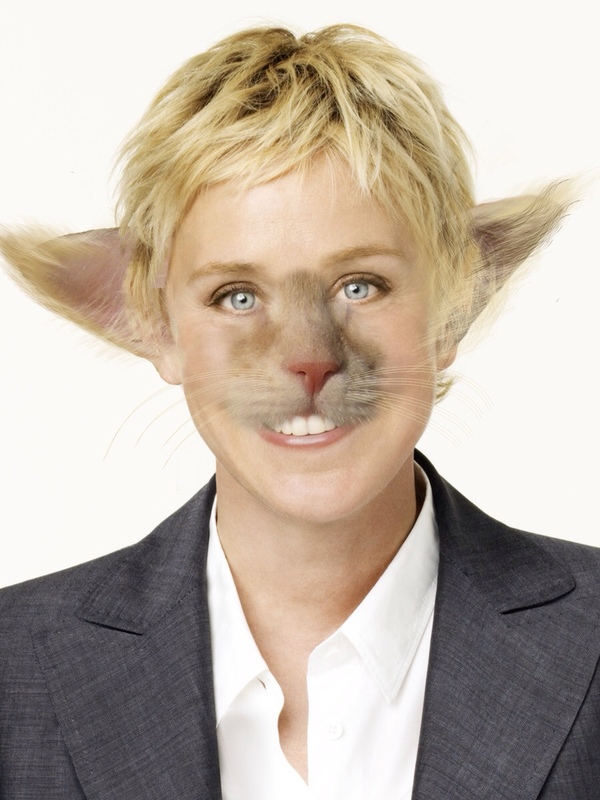 March's official cat person: Ellen before she puts on her people makeup. Ellen's real name is Ellen Degenpurrus. She wakes every morning alongside her cats and Portia, the woman who takes care of them. Then she puts on her people make up and climbs in her carrier so Portia can take her to her studio, where people have to wait on her hand in feet (another sure sign she's really a cat). She is such a great cat person that her mommy named you after her.